Question : What will be the release date of the elad fdm-s3 ? Just talked to Elad and they are waiting for the FCC approval, they hope by the end of the year they will be selling it, You can get on the list so you will be notified when the radio comes up for sale. There is a tradeoff between the bandwidth and the quality of the signal. The properties/preselector you need for MW is very different what what you need for 28 mhz. Getting them together in one shot is good but also has its processing challenges for the SDR. 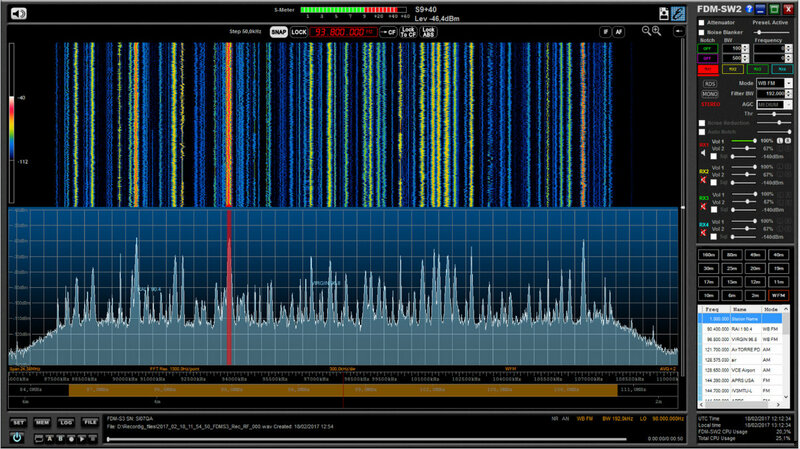 In fact when using an SDR rule of thumb should the narrrowest bandwidth that you need such as one ham radio band at a time or one broadcast band at a time. You can see why manufacturers of the higher grade SDRs like flexradio and anan have not played the bandwidth game. That is not to say that custom made SDRs for government orders do not receive/record/archive the entire hf spectrum for later data mining. As speech recognition and other tools become more advanced these saved spectrum recordings can be archived, researched and analyzed just like we do with the electronic copies of 19th century newspapers. Hi Walt, I know you often DX both MW and SW when you are visiting your place in Haida Gwaii. When propagation is good throughout MW upwards, this would be a fine way to capture all the action to DX with the WAVs later. I notice that CPU usage during the screen capture shown was 20% for the FDM-SW2 software running the S3 hardware. I suspect that the most important parameter would be the throughput of the USB 3.0 connection, all the way from the SDR, to the controller chip(s), the data bus on the motherboard, and to the solid state drive. The actual CPU speed would be secondary. Sorry I wanted to say “10.7 MHz IF Output” instead of “IQ output”. If the IQ bandwidth output from the coming IC-R8600 is wide enough is going to be a very powerful combination. I will too likely need to get a more powerful computer. Does that also mean that one could record the entire SW band at one sitting, too? 87 to 107 MHz, or perhaps 0.5 to 20.5 MHz? Wouldn’t that truly be something amazing. Of course, I can’t really think why I’d want to do that, besides something really cool to do! Perhaps studying the noise floor? Antenna work or comparisons. Anyway, fun to dream! Presumably one would need one fast computer! My Dell already has trouble sometimes with Perseus recording just 1.6 MHz of spectrum. That was my first thought too. One could easily record most of the shortwave spectrum in one sitting with such huge bandwidth, but I suppose that would already be kind of in the overkill territory. The reason I say this is that I recently studied the behaviour of the shortwave bands across time (https://swling.com/blog/2017/02/visualising-shortwave-band-activity-throughout-the-year/) and it seems that it’s almost never the case that all of them are active at the same time. 12 MHz would probably be enough. Also, at Elad’s 24 MHz bandwidth you would likely burn around 400G of disk space for a one hour recording. Agreed. I think in terms of research, recording the whole HF spectrum would be fascinating. But as you mention, I typically don’t need to record more than one or two meter bands simultaneously during band openings. If the FDM-S3 would have the ability to break apart the bandwidth into two separate and independent receivers (I’ve no clue if this would be the case), it would be fascinating to make simultaneous spectrum recordings. The Titan SDR does this–indeed, at least the Pro version will record up to four 325 kHz +/- (can’t remember exact bandwidth) spectrum recordings simultaneously.